Catch him on tour now with Little Simz! As an artist, there’s a lot of time, energy, and self-awareness that goes into fine-tuning your craft. Whether you’re a painter, dancer, or musician, finding the “you” in your work is the ultimate goal, a rare feat which Brooklyn-native, CJ Fly, has achieved with his latest album, Flytrap. A solid listen through the LP's 14 hard-hitting tracks and it’s clear—this is not just a collection of singles, it’s a personal narrative. Said X factor is not something that one obtains overnight, either. 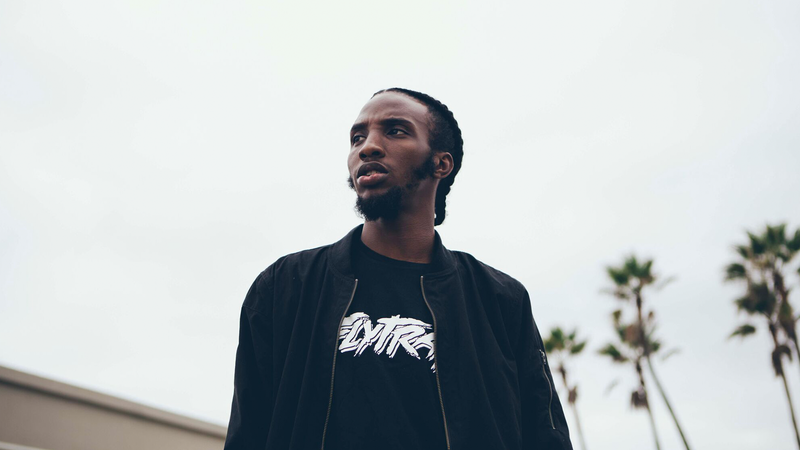 While the December release may serve as his major label debut, the 23-year-old lyricist has been honing his skills since 7th grade, founding and serving shortly thereafter as a member of the hip-hop collective Pro Era along with Joey Bada$$, Powers Pleasant, and Capital STEEZ. From hitting the road with Wiz Khalifa and A$AP Rocky to opening for Mobb Deep, the “Now You Know” performer is a no stranger to working massive crowds. His onstage presence? En pointe—something that his fans will get to experience in the flesh when he opens for London emcee, Little Simz, on her Welcome to Wonderland North American Tour this month. We got to chat with the talented (and witty-as-hell) rapper ahead of the upcoming run, which kicks off in Philly on February 27. From Bow Wow, to exes that won't go away, to what he’ll be rocking onstage, we covered it all. Check out our interview below, then make sure to track CJ Fly on Bandsintown so you don’t miss him when he hits the stage in a city near you. Your new album, Flytrap is dope. Are there any songs that you’re most excited to perform live on your upcoming tour with Little Simz? Before Flytrap came out I was on tour in Europe with Joey Bada$$, and I was doing “Always/Confined”—that was always a magical song. I wanted to see how people reacted to it not even knowing . Aside from that, I’m excited to perform all the female-oriented songs like “Lethal Allure”, and the newer, happy songs like “Perennial”—just see the reaction from people getting the opportunity to hear these uplifting tracks live. "Everything I create is performance art like, when I’m in the studio, I think about how it’s gonna be on a stage; that’s my whole approach." The song “Get Me” has sound bites from your mom, which I love. What is that song about? “Get Me” was a song I made while in Toronto. At the time my grandfather was in hospice, he was sick. I was working with a producer from the area named Goldsoul—I had never met him before. He picked me up, and you know, it’s always good to meet people and make friends and stuff like that. So he drove me to his studio, like five, ten, fifteen miles from my grandmother’s house, and we were basically just there vibing, smoking. I had the verse for a while, but I didn’t have the right beat and the right hook and everything to make it all make sense. We were just vibing out and recorded that song—I didn’t re-record it after that, I kept the basement version, his crib version instead of going to the actual studio because there was something magical in it. I added my mom probably about two months before the album came out. Yeah, it was a very special song to me. You can't recreate that moment. Is there a city that you haven’t played before or one that you’re most looking forward to on this run? I love any LA shows or California shows; the fans over there are just different, you know? The West Coast love is really special. I just have a connection with that side of town. On “Vibrations” and “Diamonds” you’re singing more than you have in the past. Do you feel more comfortable singing onstage now than when you first started out? When I first started out, I didn’t wanna be categorized as anything other than a rapper and a lyricist. It was this big fear of stigmas like, “Oh he’s a singing rapper”. Yeah, exactly, right? And now who’s the king of everything? People were hating on him before and now people are like, “This is it.” I’ve always wanted to sing more stuff like that, and I definitely feel more comfortable now. I’m older and more mature, more comfortable with my sound. That’s what it was all about. When I came out, I didn’t know exactly what CJ Fly’s sound was. I was just trying to be the best rapper I could and represent Brooklyn, Bed-Stuy—follow the best like Biggie and Jay Z. That was my only goal at the time. Right now I want to be the next D’Angelo mixed with Jay Z. So that’s my goal now, it’s different. And I definitely want to cater to the female audience more too; I feel like I owe it to them. Did you say “Now You Know” was written about an ex? That was the vibe I got. Actually, it wasn’t written, it was freestyled about an ex. She texted me probably like a week or two before that song was made like, “Hey” to catch up and I was like, “Hm, nah,” and then that song came along. How is performing solo different than hitting the stage with multiple people, a la Pro Era? Is it a different vibe? Did it take time to get used to? Well, before I met the guys I had been rapping. Before we had officially made Pro Era, the first person I had performed on a stage with was Capital STEEZ. Him and I did two shows in our High School and I did one of them by myself before that. Before we actually started touring, we were doing like certain rap things coming up, but actually doing it on an actual stage with fans and a big crowd, it’s a definitely a different experience; your homies are there to give you that extra boost of confidence, you know? I was born as an only child, I never really cowered away from any situation. I’ve always came out and prevailed and showed my stage control and showed that my stage fright is never real. You’ve mentioned that growing up you didn’t really listen to a ton of hip-hop. What was your first concert? If you could co-headline a tour with anyone, living or dead, who would it be? Can I have three answers? You can absolutely have three answers. Alright cool. So I would definitely tour with D’Angelo. Second of all, I would tour with Jay Z. But three would probably have to be either Bob Marley or DMX. You feel me? Because not a lot of people are going to Africa and all these other places to perform those anthems. So that’s where I’m trying to take it. You have a capsule collection with ZANEROBE. What’s your favorite piece and will you be wearing it on the tour? My favorite ZANEROBE piece? They have so many. My whole wardrobe is ZANEROBE. I love our collab, the Flytrap t-shirt. I’m definitely going to be wearing that. And we got a lot of new merchandise on sale too, Flytrap merch. Yeah a few one-off pieces that my fashion designer styled too. Best interaction that you’ve ever had with a fan, a stand out interaction? I think most recently I was at Blue Note and this kid came up to me and talked to me about my first mixtape which was put out four years ago. The way he was speaking about it made me feel like it was something that came out today and it was so special. He was like “Yo, CJ, how do you even put these words together?” and it made me think like, “Damn, I might have to go and listen to this sh*t again” because they way he was describing it was so special. He was like “The wordplay—you’re one of the best. The concepts, like, what were you even thinking?” And I’m looking at him, like honestly I don’t even remember—that was like four years ago, a different mind space, you know what I mean? I was very appreciative, I didn’t even know how to react, it was just like overwhelming compliments. Four years is a really long time. People change a lot in four years. Definitely. I’m 23 now, four years ago I was 18, 19. I was in a different mind state, I wasn’t even fully an adult. I’m still not an adult! I’m a kid.